Outdoor roller skates will have your child speeding through the neighborhood with all of their best friends. Kids zoom through the wind as they build their leg muscles and get exercise without it feeling like a chore. The best roller skates for kids feature a combination of style, durability and fun. 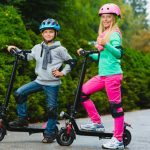 Instead of making you do all of the work to look through hundreds of listings online, Kids Ride Wild, made it easy to find the best quad skates for kids by compiling the top 5 options. 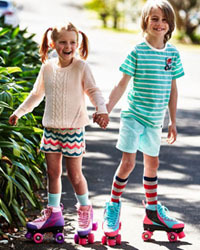 Similarly to our previous post about the best inline skates for kids, this post will bring you insight on the best skates for both boys and girls along with a practical guide on how to choose the perfect pair for your child. The Roller Derby Boy’s Fun Roll Adjustable Roller Skate is a pair of skates for kids that features a lively bright yellow, black and blue design. These skates come in two different adjustable size options: small for sizes 7 to 11 and medium for sizes 11 to 2. The cam lever locking buckles allow kids to adjust the size to fit their feet for a firm, comfortable feel. These skates are designed to stay in place on your child’s feet while they are skating around outdoors or in the skating rink. Kids enjoy smooth rolling with the polyurethane wheels that are durable enough for frequent use. Great for beginners, the large wheels are spaced in the back to make it easy for younger children to balance and skate independently. These toddler roller skates are man made and build for extended comfort with soft padding on the inside of the boots. The molded ankle supports are constructed to help with balance by keeping children’s ankles from shifting around. Not only are these roller skates comfortable, but they foster a smooth riding experience with grease sealed 608ZB bearings. With plenty of durability to last for years of skating fun, you can be assured that the Roller Derby skates will grow with your child. 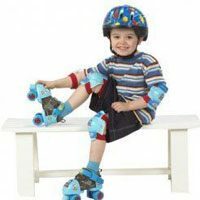 Boys love to have fun rolling around on these adjustable roller skates. >> Check out Roller Derby Boy’s Fun Roll Adjustable Roller Skate on Amazon right here. The Chicago Boy’s Sidewalk Skate feature a classic design that is perfect for first-time skaters. The wide urethane wheels provide extra stability making it much easier to balance compared with other roller skates. Stopping is no problem as the large toe brakes ensure riders safely come to a complete stop. There is plenty of support for your child to skate for hours with the three-quarter athletic boot that has a padded ankle collar. Kids love being able to skate in comfort while rolling smoothly over bumps and curves. 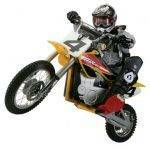 The semi-precision bearings allow kids to reach high speeds without having a rough ride. Even beginners find it easy to turn wearing these skates with their double adjustable chassis. These skates have a lightweight construction weighing at a total of 4 pounds making them easy to maneuver for turning and stopping. They are extremely durable for use as outdoor roller skates but can also be used indoors in the skating rink. For added precision and versatility, the torsion action trunk is fully adjustable. You can be assured that you will find a size to fit your little one as they come in 7 different children’s size options including 1, 2, 3, 4, 5, J12 and J13. The blue lace-up front also includes a fold over Velcro strap for a secure fit around your child’s foot. With a bold black, blue and red color scheme, kids will want to show the man made skates off to all of their friends. >> Check out Chicago Boy’s Sidewalk Skate on Amazon right here. The Roller Derby Girl’s Laser Speed Quad Skate will have your little girl skating at high speeds while they are learning how to balance. If you are searching for a pair of cheap roller skates for kids that don’t sacrifice on quality or style, these quad skates are an excellent choice. Girls love the white, black and blue design that is both simple and attractive. The 54mm clear urethane wheels encompass a pro core for maximum durability which means that your little one will get plenty of time skating both indoors and out. The Tru-Tac chassis and ABEC 7 bearings allow children to easily navigate around cones and other obstacles. Kids prefer these skates over other girls roller skates because the boot is reinforced for a cushioned fit. With a padded collar and heel stabilizer built into the skate, there is no shortage of comfort for children wearing the Roller Derby Girl’s Quad Skates. The front of the boot is laced in the front with a Velcro power strap to keep the boot from shifting around while in motion. With single size options ranging from children’s size 3 to size 8, you will be able to select a size that will best fit your little girl’s shoe size. The man made skates weigh only 4 pounds which is fairly standard for toddler roller skates. They will last for years or until your child needs a larger size. The aspiring skater in your life will have a blast cruising down the sidewalk in these exciting roller skates! >> Check out Roller Derby Girl’s Laser Speed Quad Skate on Amazon right here. The Chicago Girl’s Adjustable Quad Skate is a long-lasting pair of skates built for smooth rolling around town. If you are in search of the perfect pair of adjustable roller skates for kids, these man made skates will be a hit for your little girl. The attractive design is full of cute colors including white, pink, light purple and white. Not only are they great for show, but the Chicago Quad Skates are comfortable for extended periods of riding. Padding lines the inside of the skate for extreme cushioning along with a molded boot to keep your child’s ankles from shifting. The micro buckles around the ankle and over the top of the boot ensure ultimate adjustability for 4 sizes from 1J to 4J. Kids have no trouble riding over cracks and bumps with the thick composition wheels and semi precision bearings. The four wheels make these skates extremely stable with an oversized breaking pad on the front for a firm stop. Parents rave how well put together these skates are for toddler roller skates as they function well and are great for beginners. As your child grows, they will be able to further develop their skating skills while still fitting into the skate boots. While they don’t reach extremely high speeds, they help children build their balance and coordination while rolling around on hard surfaces. Your little princess will love the adorable design and beginner-friendly features! >> Check out Chicago Girl’s Adjustable Quad Skate on Amazon right here. The Roller Derby Boy’s Trac Star Skate are the ultimate pair of skates when it comes to design and affordability. These man made skates feature a professional-looking style with red and silver colors along with a custom design around the shell of the boot. Offered in two adjustable size options, you can choose either medium for sizes 12 to 2 or large for sizes 3 to 6 based on what will fit your child’s feet. The cam lever buckles lock firmly into place and make it easy for kids to adjust the size to fit their growing needs. The molded shell offers premium comfort with a hinged cuff, kids will not want to take these off even after hours of exercise! These skates are great for any level of skating expertise with a sturdy frame for kids to balance. The large 54mm urethane wheels are durable and can be used on smooth surfaces both indoors and out. For skaters who thrive on practicing with obstacles, the wheels are attached to the lightweight frame with 608Z Excellerator bearings built to flawlessly handle curves and turns. Not only are they high performance, but parents love the fact that the liner can be removed for easy washing. This is a huge advantage because it can be a challenge to get the odor out of skate boots from extended use. If you are looking for an adjustable skate that will last longer for your child’s skating fun, the Roller Derby Trac Star Skates are surely among the best roller skates for kids. Boys will want to skate everyday with these comfortable outdoor roller skates! >> Check out Roller Derby Boy’s Trac Star Skate on Amazon right here. Make sure your child’s skating experience is a safe one with the Kuyou Kid’s Protective Gear Set. This set comes with everything you will need to protect your child from injury while they are speeding around on their new pair of roller skates. It includes a helmet, 2 elbow pads, 2 knee pads and 2 wrist pads. The helmet measures head sizes 18.9 to 21 inches to fit smaller children who enjoy roller skating or other extreme outdoor sports. 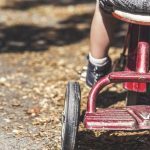 Kids will have full protection while in motion so if they do happen to fall, they won’t need to worry about skinned knees or palms. These pieces of protective gear are both comfortable and durable for extended use. The thickened soft sponge padding is breathable which keeps children from overheating or feeling restricted. 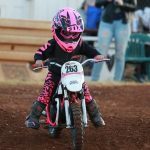 Let your child pick out their favorite color and make sure they put on each piece of gear before riding. Kids have a variety of different color options to coordinate with their skates including black, blue, green, pink or red. The pads can withstand plenty of falls as your child becomes more confident in their skating abilities. Parents are assured of their child’s safety when they put on the helmet, elbow pads, knee pads and wrist pads. Each piece is essential to protecting all of the common impact points for falls. Kids will want to put on their helmet and pads when they realize how much protection this set provides! >> Check out Kuyou Kid’s Protective Gear Set on Amazon right here. When you are narrowing down the option for which pair of skates to buy for your child, their are several important factors that you should keep in mind. You obviously want something that will fit your child’s feet but what other considerations should play a part in your final buying decision? When buying clothes, parents normally buy a size or two larger to allow the child to grow into it. Instead of following this same strategy with roller skates, you should look into buying a pair of adjustable skates. Whether you are buying a one size pair or adjustable skates, you should make sure it includes a size that your child currently fits in. Buying a size or several sizes too large can be dangerous when it comes to roller skating because your little one will have trouble balancing and moving around. Adjustability is certainly a bonus for quad skates as they will last much longer for constantly growing feet! Protective gear is an absolute must when purchasing a pair of roller skates for kids. 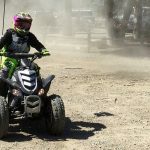 You would not want to see your child get seriously injured, hence the importance of requiring your child to wear a helmet, knee pads, elbow pads and wrist pads. While it may seem like a lot of gear for your child to put on, it will save them from getting bruises or scrapes from falling on hard surfaces. Check to see if the quad skates that you are buying for your child have a built-in turning mechanism. Some skate models have an adjustable torsion frame that can be moved with the push of a button to level of turning assistance. This feature makes it easy to adjust the torsion as your child’s feet grow. If your child is a beginner in the roller skating world, you will definitely want a pair of skates that help them to learn the ropes. For younger children, look for toddler roller skates that have sturdy wheels that are designed for added stability. Front brake pads are also a helpful feature to allow children become more confident in their skating abilities. Take note of the wheel type and size when looking for the best roller skates for your child. Small urethane wheels are often the most durable for both indoor and outdoor use. 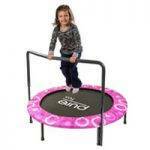 The sizes are measured in millimeters with the ideal size for toddlers being 54mm. Whether your child prefers to ride outdoors or inside the rink arena, roller skating is a healthy aerobic exercise that is filled with speedy excitement! We’ve shared the best roller skates for kids along with insights on what things you should consider when making a decision. You can find an awesome pair for your little boy or girl that will have them wanting to go skating everyday! Ps. in case you haven’t found the right pair of skates in this post, we invite you to read another article we’ve published, this time about the best inline rollerblades for kids.